The units — comparable in size to a photocopier — simultaneously shred, grind, mix and disinfect the waste with the proprietary Ster-Cid® solution. After the treatment of medical waste, the resulting material may be discarded as conventional trash, in accordance with solid waste requirements. Each system features an intuitive user interface with message display to communicate to the operator the status of the automatic disinfection and destruction process. The system is placed into automatic cycle by the simple press of the “start” push button. 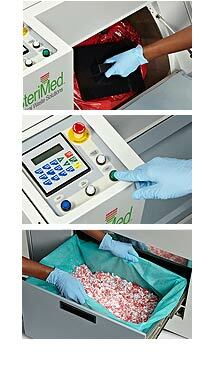 The time for clinical personnel to load and start an automatic cycle is less than 1-minute per cycle. Ster-Cid® is a uniquely eco-friendly, biodegradable disinfectant solution which has been approved for use in the SteriMed Systems. Ster-Cid® is registered with the U.S. Environmental Protection Agency (“U.S. EPA”) in accordance with the Federal Insecticide, Fungicide, Rodenticide Act (“FIFRA”) for use in the treatment of medical waste. During the SteriMed disinfecting cycle, the concentration of Ster-Cid® is approximately 0.5 percent of the total volume of liquids. The Ster-Cid® disinfectant, in conjunction with the SteriMed Systems, has been tested in independent laboratories. Results show that disinfection levels specified in the U.S. EPA guidance document, “Report on State and Territorial Association on Alternate Treatment Technologies” (STAATT), are met. The discharge of SteriMed effluent (with a low concentration of the disinfectant) into the sewer system is accepted by wastewater treatment authorities. STAATT is a worldwide organization involved in setting criteria for efficacy of alternative treatment of medical waste technologies.